Guy Hoffman, who showed scouts a major league arm while pitching for Bradley University, had an amazing jump to the big leagues. In June of 1978, after graduating from Bradley, he was pitching in Peoria's venerable Sunday Morning League. By June of 1979 he was in the big leagues with the Chicago White Sox! What followed for the Ottawa, Illinois native was a six-year big league career with the White Sox, Cubs, Reds and Rangers that saw the 5-foot-9 Iefthander pitch in 137 big league games over six seasons. For his major league career he was 17-17, posted a 4.25 earned run average, and struckout 187 hitters in 339 innings, most of his work in relief. He did start eight games for the Cubs in 1986 and was used mainly as a starter for Cincinnati in 1987, starting 22 of the 36 games he worked. 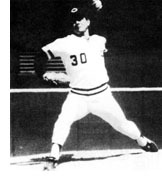 Pitching at Bradley in the 1975-78 seasons, he fanned 239 batters in 40 games, posted 16 wins, allowed 221 hits in 243 innings and shared the most valuable player trophy in 1978.